Yesterday we celebrated 1 year of the most incredible love . . . a year filled with laughter, connection, tenderness, intimacy, and the excitement for so many sweet moments that are yet to be had. How can I possibly express to you my love what is bursting from the depths of my being? . . . words are horribly inadequate to even begin to describe how you have awoken my soul . . . You have shaken my sense of reality and love, and given me an energy for life that is explosive . . .
Pablo Neruda, one of my favorite poets, does a good job describing how I feel . . .
After shabbat, on Sunday morning (7/17), we boarded the bus for Yad Vashem (The National Holocaust Memorial & Museum in Israel) . . . I trembled as I walked into Valley of the Communities. The towering walls of stone etched with the names of the towns, but it was if all of the faces of the people from those cities were staring back at me. As I walked through the maze, I wondered if this was how it felt to be in a ghetto, surrounded by walls, only able to look up, and not out. The world was blotted out by the stacked stones. All the towns and cities with a Jewish population were represented. The cities were written both in Hebrew and English. The larger, major cities were written in a much larger size. Vilna, were my family is from, where I come from, was one of these larger population centers. Jared, our friend and guide, sweetly asked if I would like to stop and talk at Vilna, or if I would be to much for me. I was do touched by his kindness, and I told him how much it would mean to me to sit and talk in “Vilna”. 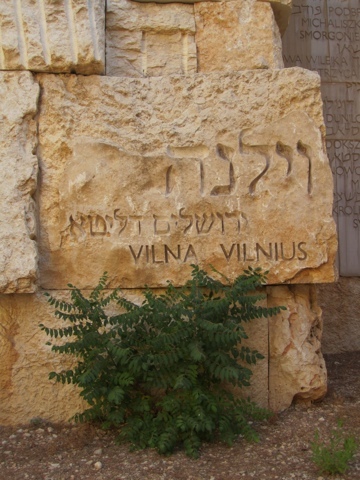 As we walked into the clearing and I saw the words “VILNA” in big bold letters, it was too much for me. The tears streamed down my face as I started to sob. It was so hard to look at the words. It was as if I was staring at all of the lives that were stopped short. I stood, one hand on April, the other holding onto “VILNA” and I cried. Jared and Menachem lead us in a wonderful conversation about the xyz. I was inspired by many of the interpretations from our group, and how moved much of the group was by what they were witnessing. Before we left, I reached up to the ledge just above the the words Vilna, and I placed two rocks, one for Grandpa, the other for Grandma. I was here, I had witnessed, and I had cried. We walked slowly from the Valley of the Communities to the Garden of the Righteous Among the Nations. We talked and shared more . . . and April and I searched for the list of Danish individuals who had saved Jews during the Shoah. 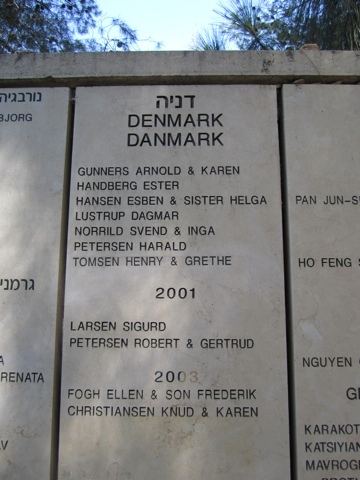 The list was small, not because Denmark abandoned their Jewish brothers and sisters, rather the opposite. The entire country, from doctors to fisherman to priests, banned together to save their neighbors. 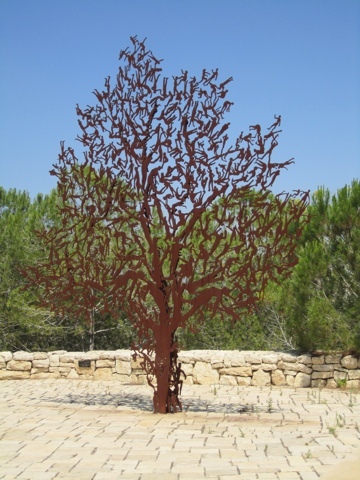 A tree has been planted in the Garden of the Righteous Among the Nations that represents the work of the entire country of Denmark. 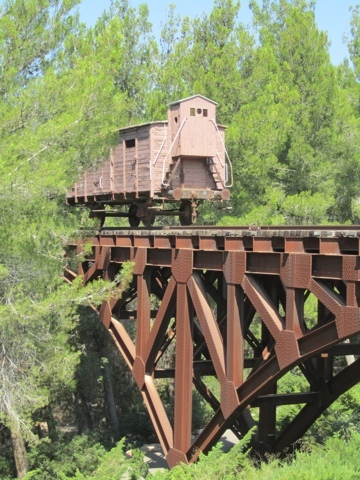 From the Garden of the Righteous Among the Nations we walked beneath a rail car used to transport Jews to the various death camps . . . the rail car sat perched on a steel bridge among us, piercing the beautiful garden with the bridges’ cold steel. We sat below the train car, able to look, but not feel its chipped paint. It seemed to demonstrate that no matter how much we learn and remember, we can never know what it must have been like . . . We can never truly understand. How can we? At last we reached the final stop . . . my stop . . . I began to tremble and sob as the Partisan Panorama came into view. It is an iron tree, with bodies for leaves, erected overlooking the valley below. I had come to bear witness to my Grandfather’s courage and determination as a partisan fighter and a member of the United Partisan Organization. He fought in the forests and alleys of Vilna, and participated in the liberation of Vilna. I had come to testify . . . to tell the world that my Grandfather did not, would not, go silently into night. Menachem opened this moment as only he can, with tenderness and warmth . . . and then I stood there. In front of our small group, all eyes on me. As I unfolded the piece of paper with my few scribbled notes I began to shake uncontrollably. Tears streaming down my face, my knees buckled, and I didn’t think I could do it. I had never spoken to anyone publicly about my grandfather’s story. But this just wasn’t his story, it was my story . . . He fought in the forests outside of Vilna not just for himself, but for me. He was my hero . . . He was a hero to us all. I cried and spoke about who he was, and what he did for us. We all cried. But I don’t think we cried out of sadness, rather because my Grandfather’s story is a story of hope. Finding hope in seemingly hopeless situations. In Israel, where we are faced with so many challenges, it can feel so overwhelming and hopeless. In spite of everything, there is so much hope and potential. You can see it and feel it . . . we can make Israel the home we want and need it to be. Like the Partisan song Zog Nit Keyn Mol . . . This is not the final road for us, nor for my grandfather’s story . 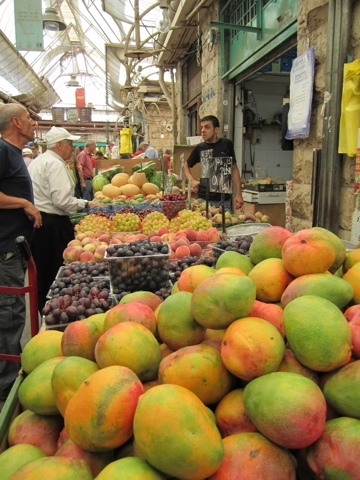 . . We have so much beauty to create here in Israel . . . We have so much work to do, to built the world we yearn for . . . We are here! And this is only the beginning. Shalom everyone! We took a few days off from blogging for shabbat. 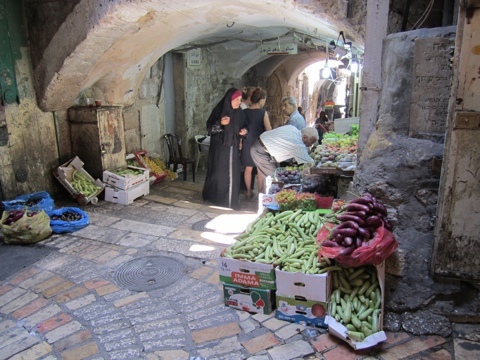 We have a lot to process and write about in regards to our first two days in Jerusalem. They we extremely powerful, and words just don’t seem to be enough right now. Today was our first shabbat in Jerusalem. 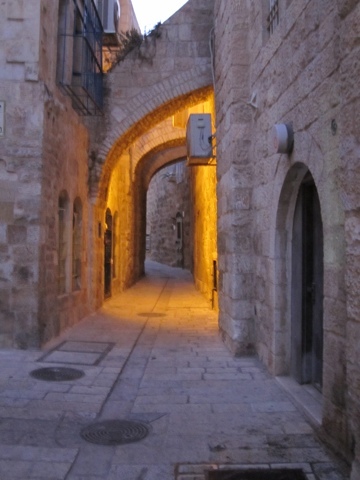 Being together, in Jerusalem, with old friends and new friends gave incredible meaning to our shabbat. 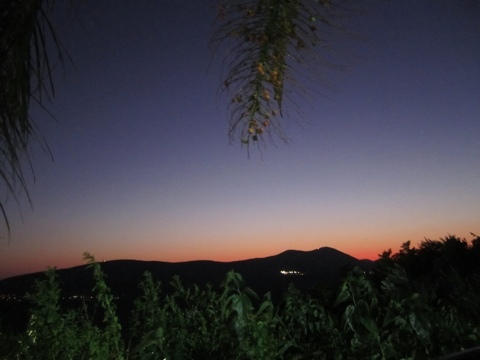 As we relaxed by the pool, we gazed up at the hills surrounding the old city and breathed in . . . even the air had a sweetness to it. Was this place different? Had we changed slightly today? Both perhaps. We had the most amazing connection with three generations of an Armenian family in the old city today. 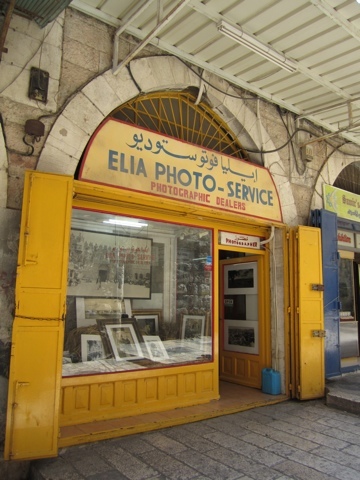 We chatted with them about Jerusalem of the past, gazed at their grandfather’s photography from the Jerusalem of old, and talked about how some things change, and some things don’t. Elia, the son, commented that Armenian’s are just passing through on a long journey. I think we are all just passing through in one way or another, from one moment in our lives to the next. It was so wonderful to spend this moment with Elia and his father. Our shabbat ended just as sweetly as it began. A picnic havdalah in a park, standing in a circle singing . . . we couldn’t have asked for more. One of things we had to do in Jerusalem, was visit the tent that Gilad Shalit’s parents have erected next to the prime minister’s residence. Menachem’s sister, Tzeira, walked us over to the tent. Unfortunately, no one was staffing it tonight, so although we could not meet with anyone, we felt, by just standing there, that we were lending our strength to Gilad, and our voice to the calls to bring our son (he is everyone’s child) home. We ended the evening with drinks and smiles, sitting with Tzeira, at a wonderful cafe off of Ben Yahuda. Yesterday we went to the Kotel, me and the woman I love . . . we davened, we cried . . . and it was sweet. Yet, we were separated, I could not hold her hand, or feel the touch of her fingers as her arm drapes over my shoulder. I want that, I need that . . . It is my identity . . . as sweet as it was, I know I need more. 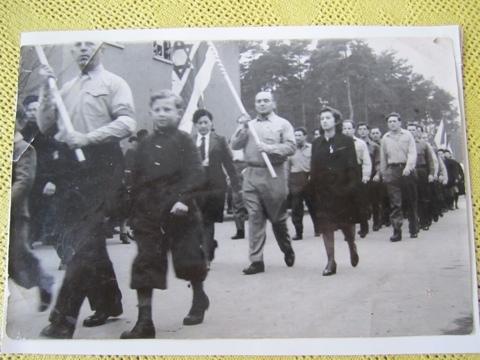 My grandparents fought in the forests outside Vilna and marched in Bergen-Belsen after the war . . . they marched and fought for Israel . . . for a place where we wouldn’t be hunted down like dogs and shot in the street like my great aunt was at the age of 13. 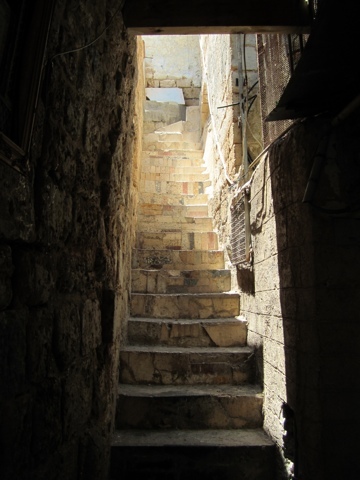 Having a place of refuge and safety is a reason for Israel, but it is not The reason. The reason is not to protect us from the outside, rather the reason is for the world, a Jewish world, that we can create on the inside. That’s what my family fought and died for . . . for the dream, for the reality of home that we can create here, in Eretz Israel. 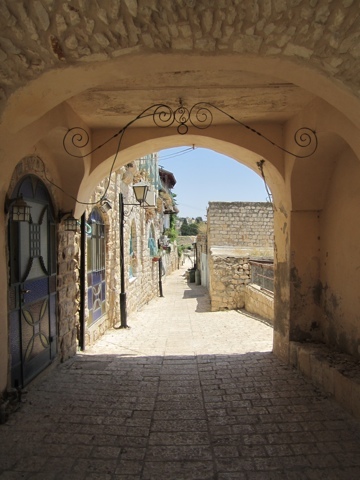 The day began early with maneuvering the winding streets of Tzfat to head out of town for a day of adventure. We had no idea that this day would turn out to be a day neither of us will ever forget. Along the way to Akko we stopped in Meron to visit Rabbi Shimon’s tomb. We weren’t originally going to stop but, Orna, a lovely shopkeeper in Tzfat, who we chatted with for sometime the day before, told us we couldn’t miss it. She was right. 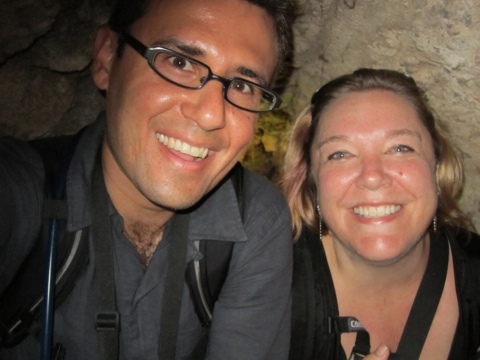 The intensity that surrounds the tomb is more than either of us could have expected. Although we were probably the only nonorthodox Jews there, the connection was profound and unexpected. We had to walk in separately and daven separately but each walked out with the same kind of experience. Orna told us, sometimes the mysticism hits you immediately and sometimes it takes days. For both of us it was sudden and dramatic. 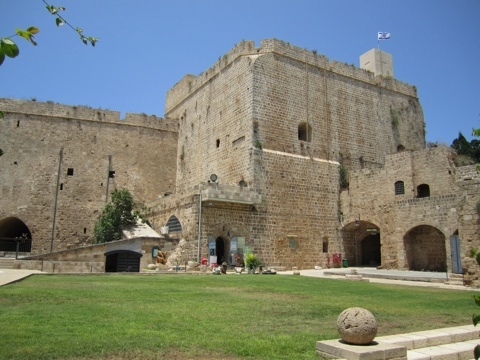 We continued on our way with Michael at the wheel and myself with three maps in hand and successfully landed in Akko. We headed for the shouk and made a B line for the best humus ever! According to expert advice from Avi and Nurit we searched out Humus Said. 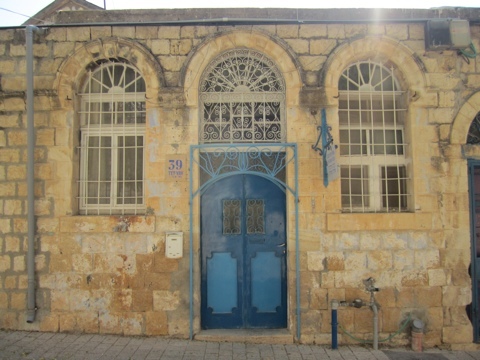 There is no exact address, like many places in Israel, but you know you’re there by the crowd hanging around the door. No need for a menu, it’s humus, humus, and humus and warm pita. Really though, it’s all you need. 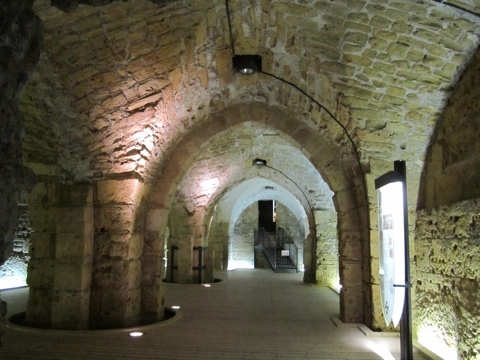 After wandering around the shouk, we then wandered though the Hospitaler’s Fortress exploring the ancient tunnels and halls. You can actually imagine what went on in those great cavernous walls so long ago. On to the Ghetto Fighters Museum in Lohamei Hagata’ot. Any holocaust museum is difficult but one that contains actual artifacts, in this case from the local kibbutz residents, is especially gut wrenching. The display case with the worn yellow stars was particularly difficult. If we were born 70 years ago one of those could have been ours. It was important for Michael to see pictures of the types of things his grandparents had to do during the time they were Partisans. Although Michael can never really know what it was like, this helps to understand his story. 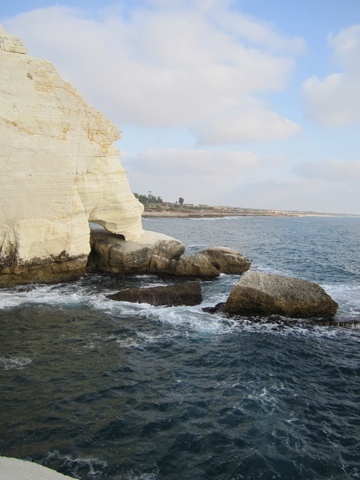 We also had a quick stop at Rosh HaNikra. 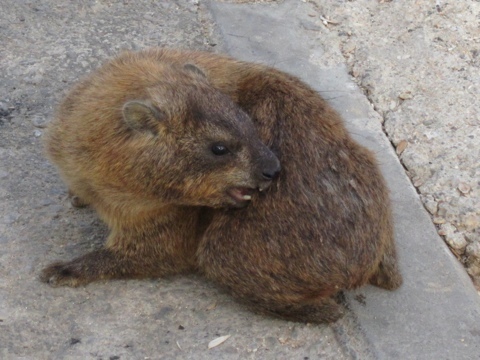 Where we walked though the grottos, listened to the waves crashing and met the local furry inhabitants called hyrax. Which we were surprised to learn are related to elephants but look like guinea pigs on steroids. Dinner was not only the highlight of the day, but of the trip so far. We checked our guide book for a recommendation and found a Kurdish restaurant in a Moshav near the border with Lebanon that sounded great. We had no idea what we were in store for. When we arrived in Shatula what we though was going to be a restaurant was actually Ora and her mother Sarah’s house. They greeted us at the front door and kindly asked us to have a seat on their back patio. We weren’t eating in a business, we were eating in their home. 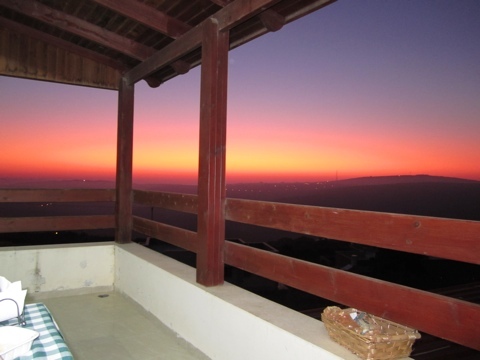 To start, the view with the sun setting, looked out onto Lebanon. It was quite literally their back yard. Music and singing could be heard from across the border and jackals called to each other as the sun went down. Ora and Sarah are Kurdish Jews, their family is from a small area in Northern Iraq called Kurdistan. All the food was made from scratch by Sarah’s hands, using her mother and her grandmother’s recipes. It was some of the most fantastic food we have ever had. 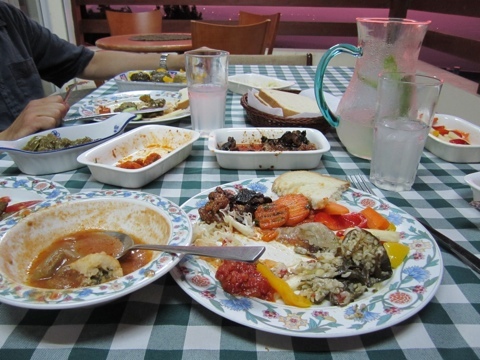 The fragrance, spices and the texture of the food were like nothing we have ever eaten. Not only was the food such an incredible treat, but the company of Ora and Sarah was the best part. We got to hear about their lives in Israel and Kurdistan and about the tremendous lives they have lead. 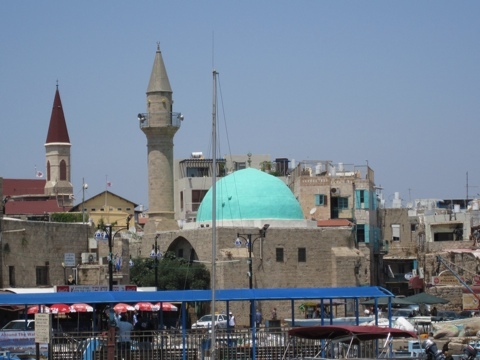 Sarah, who was probably in her late 80’s traveled back to Kurdistan ten years ago, on her own, with an Israeli passport, to plead for the return of a Torah. 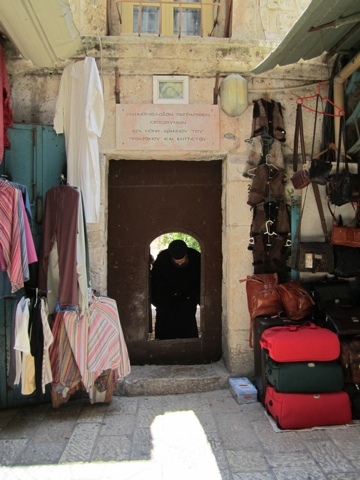 She tracked down the man who she knew to have the Torah, the Muslim chief of the area, and requested its return. 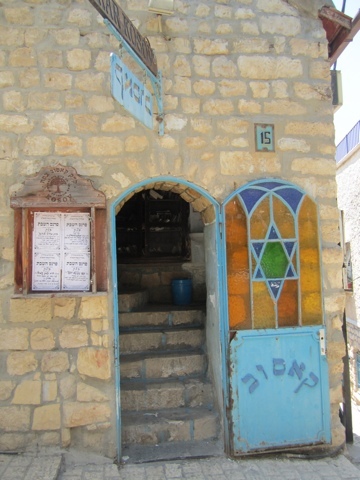 The locals believed the Torah provided them protection and wanted to keep it for more time. A fascinating thought when you consider the area is all Muslim. Although she was not successful in bringing the Torah home, her bravery is remarkable. By the end of the evening it was as if we were sitting and having dinner with old friends, and we were encouraged to come back the next day. We were both so honored to be asked to return for a Shabbat dinner at their family table the next time we were in Israel. 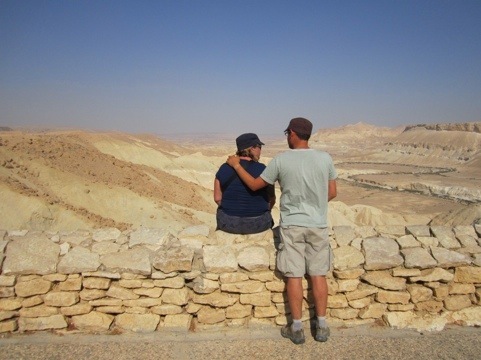 For us this is what Israel is about…the connections, the friendships and the love between Jews no matter where we come from. We promised them we would return for a Shabbat dinner and we intend to keep that promise. 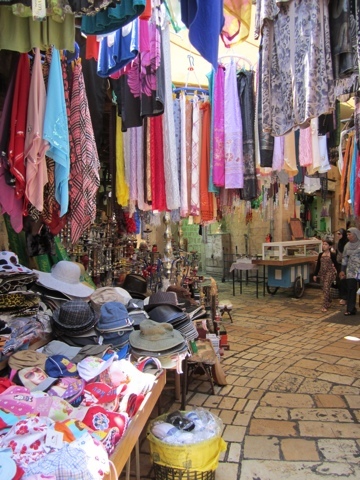 We are packing our bags and moving to Tzfat! We have already dreamed up the business we will open so we can join all the friendly and wonderful people we have met. 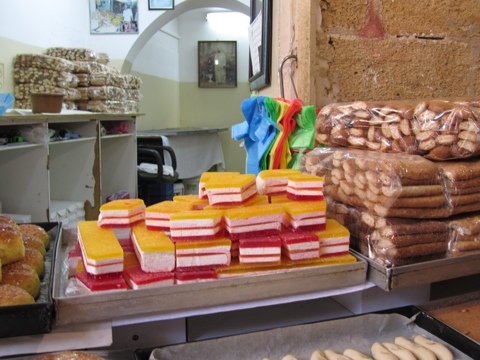 From gallery owners to cheese makers, folks in Tzfat are a remarkable group. Chaim, a seventh generation cheese maker invited us to have a cup of Turkish coffee with him after we tasted his dreamy varieties of cheese. There were so many pieces of beautiful art, from painting, jewelry and sculpture that is was hard not to want to bring something home from every shop. 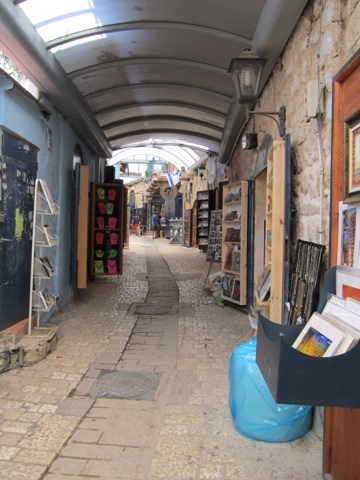 We walked from the Artist Colony to the Jewish Quarter where we wandered around new and ancient synagogues. Here the temples are tucked in any corner you can imagine and each one has a different feel. 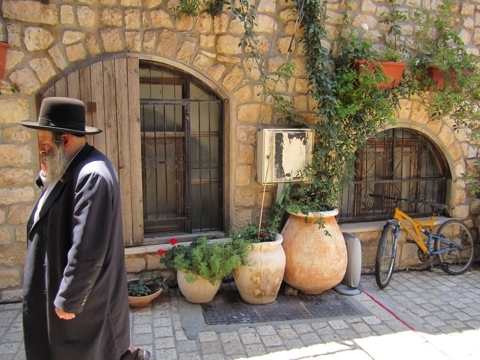 Most are only evident by tiny signs on the door or the small crowds of Orthodox men moving in and out. There is so much energy and meaning to being here in Israel-it is almost indescribable. We need more time to wrap our brains around the words so we can adequately express what we are feeling. What we can tell you, is that it is powerful, deep and life changing. 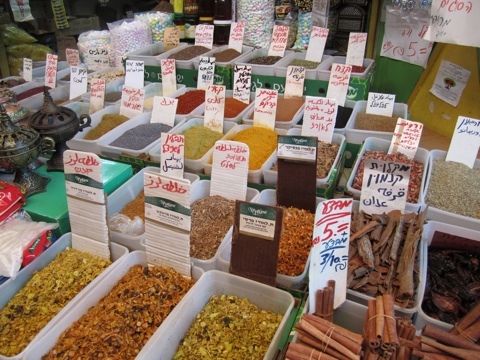 CNS: Netivot Shalom in Berkeley!